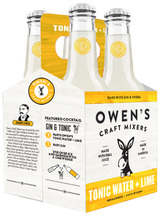 From the beginning, Owen's has been committed to bringing premium cocktails to your table. They wanted to create a mixer that was easy to use and full of real ingredients. In 2 easy steps, you can have a delicious, high quality cocktail in your hands. Simply just mix with alcohol and voilà- a craft cocktail right at your fingertips!